The organopónicos and intensive gardens are the primary methods of urban cultivation. The only difference between the two is the structure of the garden: whether cultivation occurs in raised beds or in the preexisting soil. Because of the poor quality of many urban soils, the organopónico method is the most popular. Although statistics are still being compiled, official estimates in 1996 calculate the total number of organopónicos in Cuba to be about 1,613, covering about 250 hectares. They have an average yield potential of 16 kg of produce per square meter, with a total production of about 840,092 qq. [1 quintal equals 100 pounds]. There are about 430 intensive gardens with a total area of 165 hectares and a total production of 421,000 qq., or about 12 kg. of produce per square meter. More data are available for the capital city of Havana, which has the largest and most developed system of urban agriculture in the country (Table 2). 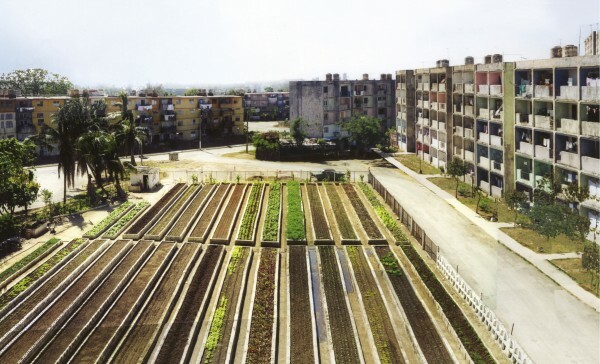 Urban agriculture in Cuba has rapidly become a significant source of fresh produce for the urban and suburban populations. A large number of urban gardens in Havana and other major cities have emerged as a grassroots movement in response to the crisis brought about by the loss of trade, with the collapse of the socialist bloc in 1989. These gardens are helping to stabilize the supply of fresh produce to Cuba’s urban centers. During 1996, Havana’s urban farms provided the city’s urban populationwith 8,500 tons of agricultural produce, 4 million dozens of flowers, 7.5 million eggs, and 3,650 tons of meat. This system of urban agriculture, composed of about 8,000 gardens nationwide has been developed and managed along agroecological principles, which eliminate the use of synthetic chemical pesticides and fertilizers, emphasizing diversification, recycling, and the use of local resources. This article explores the systems utilized by Cuba’s urban farmers, and the impact that this movement has had on Cuban food security. It’s awesome designed for me tto have a site, which is useful designed for my know-how. Thank you! I’m glad to receive this kind of feed back!